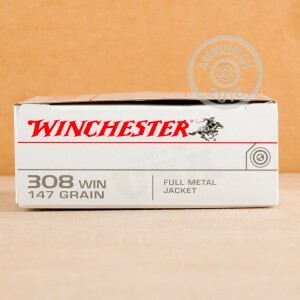 This .308 Winchester "white box" ammunition is an affordable, accurate long-range target load for M-14s, AR-10s, FALs, and other .308/7.62 NATO rifles. 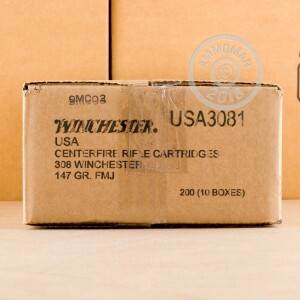 Each cartridge in this box of 20 fires a 147 grain full metal jacket bullet at a muzzle velocity of 2,800 feet per second. 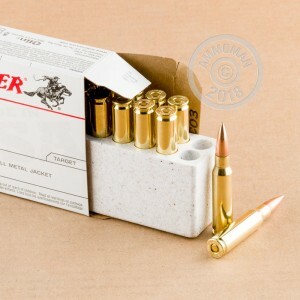 Remember to keep your per-round costs low with free shipping from AmmoMan.com! All valid orders over $99 qualify--no codes to redeem and no shipping calculators to deal with.